Chicago police made fewer than 3,200 arrests for pot in 2017. That’s the fewest arrests since 1968, according to a WBEZ analysis of Chicago Police Department data. To help walk you through the numbers, and get a sense of their scale, here’s a look at how those arrests could fill up some of the city’s concert and sports venues. Pot arrests used to account for half of all drug arrests in Chicago, but last year saw pot arrests making up only 28 percent of all narcotics arrests. Police made more than 11,400 drug arrests last year — a level not seen since 1973 — when Richard J. Daley was still mayor. This means narcotics arrests are also at a historic low. Anthony Guglielmi, a Chicago police spokesman, said the decline in arrests is, in part, because the department recently expanded a program that helps nonviolent drug offenders receive substance-abuse treatment. Marijuana arrests began to steadily drop as local officials began relaxing penalties for marijuana possession. Chicago cops in 2012 scaled back arresting people for small amounts of pot, opting to issue tickets, albeit rarely, and the Cook County State’s Attorney’s office announced in 2015 that it would no longer prosecute misdemeanor pot possessions. In 2016, Illinois decriminalized possession of less than 10 grams. Like Chicago, officials in New York City have also taken steps to decriminalize marijuana. That city also saw steep declines in the number of arrests. In 2016, police made more than 18,000 arrests, which is significantly down from the historic highs in 2000 when they made more than 50,000 arrests for pot possession. Over a 10 year-period, pot arrests in Chicago have dropped from over 25,000 to an almost 50-year low, just over 3,000 arrests. Credit: Elliott Ramos/WBEZ | Source: Chicago Police Data via city data portal. More people are arrested for drugs on the West Side than any other part of the city, according to police records. In 2007, police made 25,350 pot arrests, but almost 40 percent of those arrests came from West Side neighborhoods, according to an analysis of city data. Over a 10 year-period, pot arrests in North Side neighborhoods such as Lincoln Park and Lakeview few at a faster rate than in other parts in the city. Kathie Kane-Willis, a policy and advocacy director at the Chicago Urban League, has studied drug policy for more than a decade. She said drug arrests create collateral consequences, especially ones that end with convictions. In 2007, Lakeview had 198 pot-related arrests. Last year, the North Side neighborhood netted only nine pot arrests. That’s a 95 percent drop for a busy entertainment district that sees millions frequent its bars, restaurants, and large-scale concerts. Last year, Wrigley Field hosted performances by artists like Dead & Company, Jimmy Buffett, and Green Day. Pot arrests on the West Side has remained the area with the most amount of pot arrests in Chicago. It's also the area where police have long focused narcotics enforcement efforts. On the West Side, the Austin neighborhood had 2,754 pot arrests in 2007, but that number fell by 81 percent last year to just 516 arrests. On the South Side, the Englewood neighborhood saw only an 84 percent drop during that same 10-year period, going from 902 to 141 arrests. Lincoln Park, meanwhile, saw only 8 arrests last year for pot, a 92 percent drop from 98 arrests in 2007. Pot arrests on the South Side had a mix of high and low drops over 10 years, depending on neighborhood. While precise neighborhood comparisons can be fraught with any number of differences, there are two constants. First, Chicago’s West and South sides have historically beared the brunt of the city’s pot enforcement — and still do. Lastly, while overall pot arrests are down city-wide, arrests fell faster in predominantly white neighborhoods than in Latino or African-American communities. The Chicago Reader, which has done extensive reporting on this disparity for years, once referred to arrest differences by neighborhood as Chicago’s “grass gap.” Last year, North Side neighborhoods, such as Lincoln Park and Lakeview, saw pot arrests in the single digits. On the South and West sides, meanwhile, arrests were in the triple digits but still significantly lower than the historic high in the early 2000s. The data suggests that Chicago’s grass gap appears to still exist. In order to analyze over 50 years worth of narcotics arrest data, two primary sources were used. First, we compiled data from archived statistical summary reports that were put out annually from 1965 - 2010. Those reports included number of arrests made, and classified types of arrests and subsets such as narcotics and those involving marijuana. 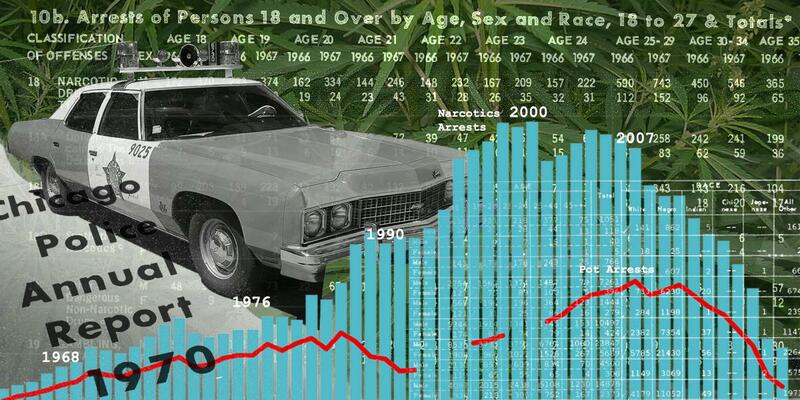 Data for marijuana arrests were missing for 1993 - '95 and 1999 - 2000. The second source of data used was Chicago Police crime data from the city data portal. Incident reports were filtered to include narcotics incidents that resulted in an arrest, and with descriptions matching cannabis. This includes the possession and selling of marijuana. The police data only tracked amounts over or under 30 grams. Chicago's pot ticketing ordinance allows for citations under 15 grams, and recent Illinois law allows for citations under 10 grams. The filtered data can be found here on Github. The maps and visualizations were made using pot arrests incidents by year, geocoding and counting them within U.S. Census blocks. Elliott Ramos is a digital editor and does data reporting for WBEZ. Follow him on Twitter at @ChicagoEl.